Now is the time of year to keep your eye out for infestations of fall webworms. While webworms can be present in smaller numbers in spring and summer, it's the late summer early fall infestation that can do significant damage to your trees. These caterpillars are most often found in pecan, sweetgum, mulberry willow, hickory oak and many other tree species. Here is a photo of fall webworms on a Bald Cypress tree. 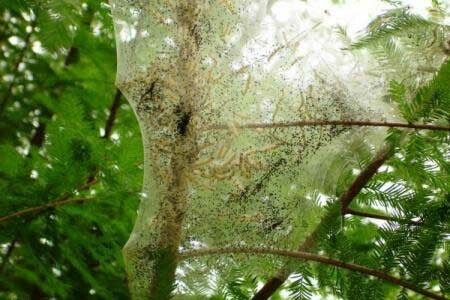 Inside these webs you’ll find masses of hairy caterpillars ofHyphantria cunea. They grow to about 1-inch long with pale yellow or green bodies, a mottled stripe and black bumps that run down the body and reddish colored heads. They are covered with tufts of long white hairs. These are the caterpillars of a lovely white moth. These caterpillars have chewing mouthparts and they can decimate your tree's foliage once they are heavily populated. They will feed on the tender parts of the leaves, leaving behind the midrib and veins. Losing large amounts of foliage can put your trees under a lot of stress. 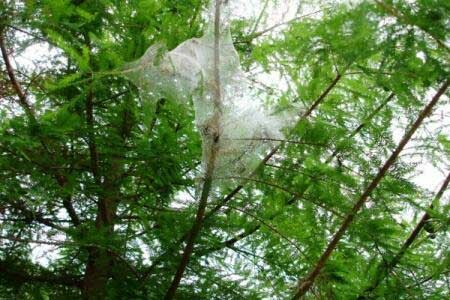 If you tree is already stressed or diseased, an infestation by fall webworms will only make the situation worse. Here at Soils Alive, we use organic methods to treat for fall webworms. Our treatments are safe for your landscape, kids, pets and other wildlife. Give us a call the second you see any evidence of fall webworms!